Who says sweets are only after dinner? One thing I love about the weekends (besides sleeping in) is having the time to cook breakfast. It’s the most important meal of the day after all! This particular recipe can actually be made rather quickly, so in my opinion that makes it even better. 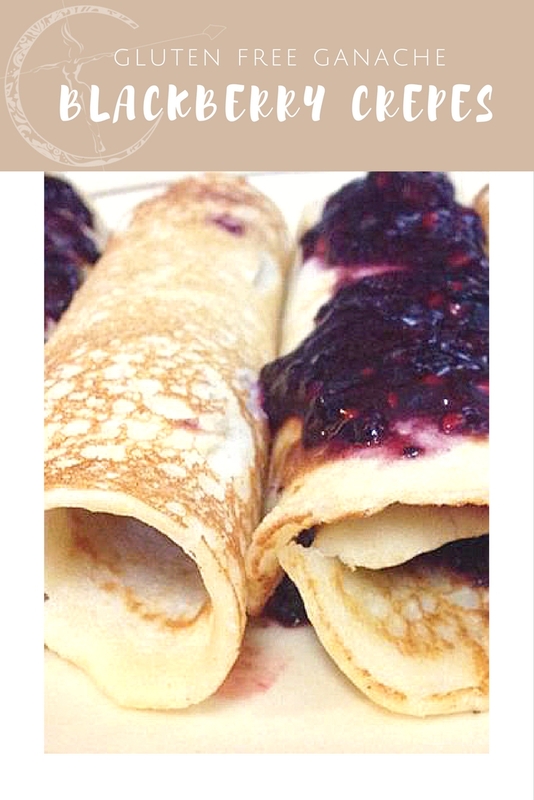 I get cravings for crepes, especially because there are endless possibilities for fillings and toppings! For these I chose to fill some with ganache and some with peanut butter, along with a blackberry puree to go over the top. I’m sure this won’t be the only variation that I post though! To start I mixed flour, milk and eggs together in a bowl. I chose to use gluten free flour for my crepes, but that is simply a personal preference. Put the blackberries in a food processor and pulse until they make a sauce to your liking. Warm up the peanut butter and ganache separately so it will spread easily. Place this aside until ready to use. Next, heat up a nonstick pan and put in some coconut oil to coat the bottom. Spoon in some of the batter and cook for about 45 seconds, then use a spatula to flip and do the other side. Remove from the pan and place on a plate. Repeat until the batter is all gone and stack the crepes flat on top of one another. Lastly you get to fill each crepe with either peanut butter or ganache (or both). Roll them up, pour the blackberry puree on top and serve! These are easier to make than you think, so I highly recommend them. Plus they can be very impressive looking! I’ve also chopped up strawberries to add inside the filling too because it compliments nicely. I’m already scheming up my next recipe! I love peanut butter, especially all natural! However, I have recently become very obsessed with PB and its amazing benefits. The ability to indulge in low fat peanut butter is such a win for me! 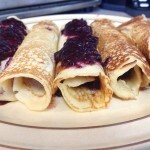 Breakfast crepes filled with chocolate spread and peanut butter and topped with a blackberry puree. Mix the flour, milk and eggs together in a bowl. Put the blackberries in a food processor and pulse until they make a sauce to your liking. Warm up the peanut butter and ganache separately so it will spread easily. Place this aside until ready to use. Next, heat up a nonstick pan and put in some coconut oil to coat the bottom. Spoon in some batter and cook for about 45 seconds, then use a spatula to flip and do the other side. Remove from pan and place on a plate. 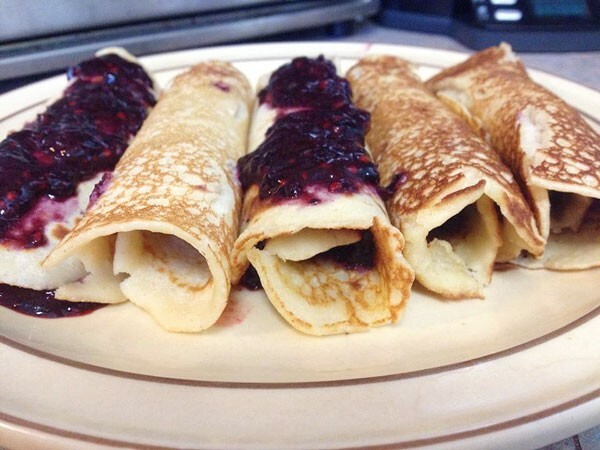 Repeat until the batter is all gone and stack the crepes flat on top of one another. Fill each crepe with either peanut butter or ganache (or both). Pour the blackberry puree on the top and serve! I personally chose to use gluten free flour for my crepes. You can also try to substitute another type of milk instead and I'm sure it will work just fine! I used Oh My Ganache for the chocolate spread, but you can use anything you like that is similar for the chocolate filling!